This 11 by 17 original art sketch features the work of legendary comics artist Walt Simonson. In excellent and undisplayed condition, it will be shipped with the utmost care. 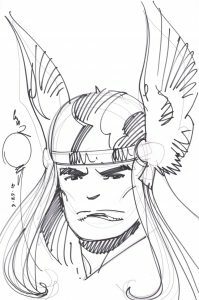 Please note- this is an actual, original piece of art drawn by hand by Simonson. It is not a copy, print or pre-printed image. It is a one-of-a-kind original!